SpeechExec Enterprise provides a simple way of working for authors and typists alike whilst providing a cost effective, easy to manage licensing model. The modular structure of Enterprise allows you to customize the system based on your current needs, whilst allowing you future flexibility to "add-on" features as your firms grows. 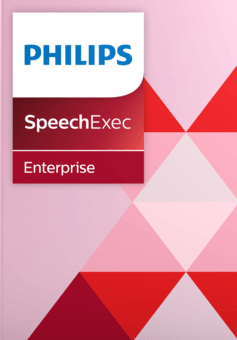 SpeechExec Enterprise is a perfect fit for customers preferring a tailor-made dictation workflow solution. It is ideal for companies with several office locations and a medium to large user base. You can even use 3rd party recording devices such as the Olympus DS Recorders. Recording functions, priority, indexing, work routing and keywords can be customized to the author’s needs. Attaching documents to dictation files keeps data organized.and desktop dictation devices (Philips SpeechMike). The transcription software allows efficient access to digital voice files. Visual workflow management, including sort, search, and filter options and job information such as author, length and priority, assure productive transcription and fast document turnaround. With the ergonomic Philips Foot Control all transcription and playback functions can be controlled with your foot keeping your fingers on the keyboard. One single license file is stored within your Enterprise License Manager. Licensing is concurrent and universal so you only need licenses for the max number of users at any one given time. Set alerts and release licenses all from a simple interface. Manage your groups, users and user settings centrally. Use Microsoft's Windows Active Directory services to simplify your administration. Web Access allows you to be independent from your office environment and local software installation. You can upload dictations from your voice recorder and transcribe them via the Philips foot control - direct from a web browser. IT can easily grant access to external employees if required. Mobile Service allows you to send dictation from the Philips Voice Recorder App via your smartphone or SpeechAir directly to your dictation workflow and see the live status of your dictation directly in the app. Future proofed solutions are a must for any professional organisation. SpeechExec Enterprise allows you to build the solution to your specific requirements - both now and in the future. Create and automate advanced workflow for moving, copying and deleting dictation files based on predefined rules and schedules. Also send automatic email notifications. The Statistics Module displays comprehensive statistics on dictation, transcription, job status, and workload. The module offers graphical output for better and clearer analysis. Results can be easily exported to Microsoft Excel, Microsoft Word, Adobe Acrobat, Crystal Reports, or displayed as RTF documents for further processing. More than 30 pre-configured statistical reports are available. SpeechExec provides an interface for automatic transcription of dictations. Dictations are picked up automatically from a predefined input folder, transcribed using the corresponding author profile with the Dragon speech recognition engine and returned to the author for correction. Compatible with the full versions of Dragon Professional Group, Dragon Legal Group and Dragon Medical Practice Edition so you can use Dragon both within the dictation workflow - as well as a stand-alone solution directly into your required application. Increase your organization’s productivity by managing users, licenses, and system settings remotely. The central administration function facilitates the configuration of worklist columns, filters, and job information. Active Directory support also allows for easier settings management. Remote hardware administration allows you to centrally configure the buttons of Philips’ dictation microphones and update the firmware. Support for Citrix and terminal server environments allow on-demand application delivery. SpeechExec can be virtualized, centralized, and managed in the data center and instantly delivered as a service to users anywhere. In addition, SpeechExec is compatible with the HL7 interface. SpeechExec Enterprise can work as a communication interface between the dictation workflow and the hospital information system (HIS). Real-time file encryption (256 bit), password protection and secure file transfer grant only authorized individuals to access documents. The optional automatic backup function protects data against accidental loss. With the integrated dictation recorder, authors can record directly into their SpeechExec software. The software works perfectly with Philips SpeechMike dictation microphones and allows for quick and easy control of all recording and playback functions (insert, overwrite and append). Function buttons can be individually programmed for added user convenience. Speech recognition software such as Dragon NaturallySpeaking can be seamlessly integrated into the solution. Whether you are dictating directly into the software using a Philips microphone or uploading recorded files from a voice recorder, you will receive extremely accurate speech recognition results which will help speed up your workflow. The software comes with a convenient integrated transcription player with pause, fast forward and rewind options. Together with the configurable Philips foot pedal it allows for comfortable and quick transcription. Predefined templates can be used, so documents are automatically created with the appropriate header and footer, saving you even more time.